Yesterday, I heard a story. There once was a very wealthy man who was very attached to his wealth. He had this bizarre idea of taking all his wealth with him to ‘the other world’ after his earthly sojourn ended. He advertised in the papers that he was willing to offer half of his wealth to anyone who gave him an idea that will “ensure” that he could take all his wealth with him to “the other world” when he died. People who saw the advertisement thought the man had gone loony. Many days passed and not even one person contacted the wealthy man. His advisors and friends told him that no one ever will because his was such a bizarre expectation. And then, about four weeks after the advertisement appeared, a man called up claiming he knew of a way this could be done. The wealthy man immediately agreed to meet him. The caller set a pre-condition for sharing his idea. He insisted that half the wealthy man’s fortune be immediately transferred in his name before he gave away the idea. The wealthy man evaluated his options and concluded that since no one else had even come forward, the only way he had even half a chance of taking at least half his wealth with him when he died was to agree to the caller’s condition. So, the transfer deeds were done, the bank transfers were completed and the two men met in the wealthy man’s home for the ‘idea’ to be shared. The wealthy man simply agreed to follow the caller’s advice without protest. He gave away the other half of his wealth joyously to the poor and needy. When he died, his whole country mourned and millions showed up at his funeral. The foolish but rich man had ended up doing good by giving freely, albeit inadvertently. Surely, we are not foolish. We do get the moral of this story straightaway, don’t we? For, what of ours have we brought with us and what will we take away? Everything that we think belongs to us is impermanent, including our Life. So, let’s give joyously. 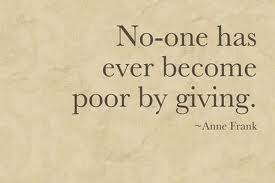 Through our giving selflessly, freely, we can make a difference, we can touch another Life! That is the only true wealth we can ever claim to have earned in this lifetime!